I, more than most know the pain of having a gorgeous tank filled with pesky little mini-anemones a.k.a. AIPTASIA. I still remember the day that I brought my first batch of live rock. I was beyond excited and I chose to ignore the ominous warnings of those “well seasoned” reef veterans that warned of parasitic infestations that rock may hold. I threw the rock right into the tank without a second thought about “curing” or “quarantining” that gorgeous Fiji premium! Within hours I realized my stunning new investment was swimming with life. Awesome, or so one noob would think. I had beautiful mini-anemones and little red sponges all over this rock! I was going to grow them and sell them. WOW, my first rock investment was turning out to be a very fruitful one indeed. In the heat of that prideful moment I decided to snap some pictures of my perfect little rock community. I wanted the world to know about the opportunities to pre-order my soon-to-be Bubble Tip Anemones and my burnt cayenne hued sponges. Moments later those pictures were shining like stars within the reef community websites I frequented. I was at my peak of my new found reef entrepreneurism. This hi-lighted moment of glee was to be short-lived. I was slammed with numerous responses filled with “LOL”, “LMAO”, and “You’re an idiot”. Apparently my first round of “automatic propagation” was a huge infestation of Aiptasia and Flatworms! What was a boy to do? That’s the question that I am going to help you answer by exploring my journey into pest control failure. Step One: BLOG BLOG BLOG. I posted a series of questions on every website that would allow this nooB to join. I was given a ton of absolutely brilliant information. By brilliant, I meant horribly expensive. I explored tons of options, in fact I explored EVERY option offered. Some where temporary fixes and others just made the problem grow at an alarmingly expedited rate. On to the journey. I was told to run out immediately and buy Joe’s Juice, Aiptasia X, Kalkwasser (create a paste), Pickling Lime, Vinegar, & many more. In their defense, ALL OF THEM WORKED…ish. I had some pretty heightened expectations every time I applied one of the compounds upon my tentacle terrors. Time after time, they would disintegrate into the deep blue, and time after time, they would return in greater numbers. Hell hath no fiery like an aiptasia scorned! The trick, which I later learned was to zap the aiptasia with the product and follow it up with the vacuuming effect of a syphon. Skip this step and your effort was hopeless. I knew that this war would not be easily won, so I brought out the big guns. Bleach. I removed ALL of my live rock and I filled a plastic tote with fresh water and a toxic dose of household bleach. I placed the rock in the tote for days and let the process begin. I was so beyond smart, I was borderline genius. How could this outbreak continue without an ounce of uncured rock remaining in the tank? I am far too simple sometimes for my reef’s good. I rinsed the rock and made certain to only return the most pristine pieces. I was so proud of my work. Awe snap, here comes the kicker. Aiptasia live all over! they were hiding away in my filters, in the sand, even tucked up into the power-heads. They were the ultimate hide-n-seek Nemesis. Within days they were back in full force and schooling me in Reef-Pests 101. Step Three: MOTHER KNOWS BEST, Mother Nature that is. I was now ready to seek out more natural solutions. I wanted to watch predator vs. prey, the way mother nature had intended. What was the course of action? There are so many aiptasia-snacking fish that I clearly had to choose based on appearance. I chose the Copperband Butterfly Fish, solely based on aesthetics this fish was the dream solution, Beauty vs. the Beasts in my living room. The Copperband is naturally inclined to eat aiptasia, and mine certainly had a voracious appetite. However, they also have a zero tolerance for any water quality fluctuations and are, as I see it… suicidal. Mine was masochist and decided that he had nothing to live for and began the process of slowly starving himself to death. It was a horribly sad process, but a reef lesson none the less. Among the Copperband Butterfly Fish there are many esteemed colleagues of aiptaisa killers such as the Raccoon Butterfly Fish, certain Nudibranchs, and my all time favorite Peppermint Shrimp. I decided to spare the lives of the before mentioned fish and go by way of the peppermint shrimp. I was told that the peppermint shrimp would have a 50/50 chance of success. I had Eustacia that were greater than a quarter in size and extended two inches. I had some seriously malicious pests on hand. I purchased three peppermint shrimp, at the less than enthused L.F.S. (local fish store) workers dismay. Even after explaining my journey into this matter, they still wanted me to buy more chemicals. I, the eternal optimist decided to bet on luck. The peppermint shrimp were released onto the battlefield at 7:00 p.m. on a Sunday, and by 5:00 p.m. on Tuesday MY REEF WAS AIPTASIA FREE !!! Granted this was a game of chance, but it was a risk I was willing to take. After all of the failed efforts, I chose to take a natural route and found out that this direction was the best fit for my reef-style. I do encourage any readers battling with this jelly-armed nuisance at home in their tanks to do some research. Look into ALL of the above mentioned options, and try to seek five more that I haven’t included. There isn’t a right or wrong approach to managing the pests within your reef, there is only your approach. I hope that this article was helpful. Good luck and great reefing. I likewise tried bleaching live rock… and had same results, The aiptasia came out everywhere, in gravel, powerheads, etc. 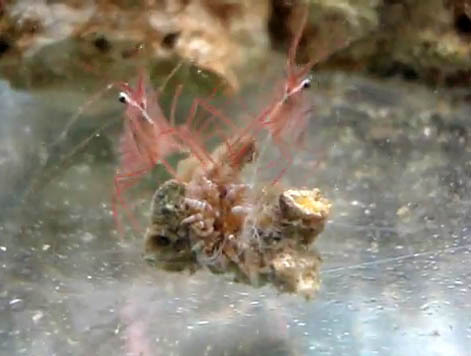 I could not allow peppermint shrimp into my tank as I understand they are not reef safe for corals. A guy at a LFS suggested injecting with a needle syringe, liquid calcium into the main stem of the aiptasia and it kills them. It worked! I just have to keep doing it for all the new outcroppings. I think it is important to get the biggest ones first before they reproduce. They shrink back fast, so you got to be quick on the draw with the syringe. I use a 1 inch, 3cc. syringe. You may want 1and a half or two inch needle if they are deeply imbedded.